It’s Raining on my Parade! Well, not strictly speaking a “parade” but you could look at it that way. 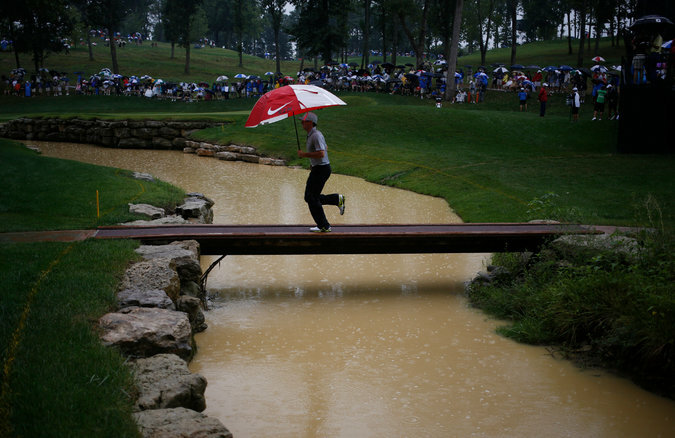 The professional golfers who are spending this Sunday afternoon batting a little white ball around a golf course in Louisville, KY at the PGA Championships… the parade of golfers is being rained on right now. I was hoping that this last day of this tournament would be sunny and nice for them, but so far, not so much. Heavy rain, to boot. Not sure I’d enjoy going to a golf tournament and sitting outside in any and all kinds of weather, either. At least at the baseball parks, you can scoot in under a roof if needed, but out there on the golf course, it’s just you, the trees, and old Mother Nature. Since I joined Facebook for the second time (I must have been gone so long that they lost all my old info), I have been (understandably) drawn in to it and have spent way too many hours farting around in there. But hey, it’s kind of fun, but I’m trying not to overdo it. I’ve got the golf on TV now and am praying this rain doesn’t prevent my Rory McIlroy from finishing his two rounds today – he’s in the lead by one shot so I am very thrilled to be watching him. I’ve also seen some tennis, but the tournaments are smaller and various on my channels and sometimes not the players I’m interested in watching. That said, there is a tennis player called Svetlana Kuznetsova whom I’ve always loved. I guess I chose to love her (not in a romantic sense, of course!) because she’s never seemed like a “hot” female tennis player. She’s not your “come-and-get-me” type of woman that you see a lot in sports. She is real, is one tough lady, and has just won her first WTA tournament in 4 years, so I congratulate her and hope to see this more often. Now that I’ve dragged myself kicking and screaming out of Facebook today in order to pay more attention to the golf, the darn golf game has been put on an “extended rain delay” because that rain is coming down like it’s the end of the world. Wow. That will make the course more like a green lake and the maintenance people will need to spend a lot of time squeegie-ing out the water from the grass. So no golf right now. I just made Paul new ice cream (peppermint stick). He needs new cookies, as well, but the temp is going up here after a lovely August so far of cooler weather – and I don’t fancy putting the oven on for cookies since I am trying not to turn the AC on if I can help it. I have the sneaking suspicion that it may go on later today, though. So that’s how things stand here. I think I’ll grab my current book (which is “Twopence to Cross the Mersey” by Helen Forrester and is, BTW, a fabulous little book about life in Liverpool in a poor family in the 1930’s) and see how much I can get read before the golf starts up. Oh, on the golf course, which is flooded with rainwater, they are showing huge geese paddling around in the large puddles! A BIG P.S. – Rory won! Hip-hip-hooray! 6 Responses to It’s Raining on my Parade! Yep. He sure did. I was thinking of you as the tournament came to a close and knew you’d be happy. About the Forrester books, I have two of them (in one book) and am reading #2 book, “Liverpool Miss” right now. I’ve just ordered two more in the group of 4. I find it amazing that people lived like she describes, not having had to go thru abject poverty like that myself, and it sure puts things in perspective. We take so much for granted today and I try to think back to Helen in that life she writes about to snap me back into reality and to appreciate what I have. I was never a golf enthusiast, Eric, until I got interested in one person, Rory. I used to watch is ex-fiancee, Caroline Wozniaki, who plays top women’s tennis (they just broke up) and just having someone you like in the game makes it more interesting. Once I sat and actually watched a whole tournament, it has just clicked with me and I am loving it. There is so much more to it all than just batting a ball around the grass! DH and I were eating lunch outside today. The temp is around 77. Very comfortable while sitting out there but by late afternoon the house may get hot enough from the sun that the air conditioning may come on. Have read all four of Helen Forrester’s autobiography books, plus many of her other books. Great writer. Despite her hard life as a child Helen lived to the good age of 92. About all I know about golf is how to play the rudimentary golf game that came on my first PC back in about 1990. The book sounds interesting. Two pence. Is that how much the ferry across the Mersey cost Gerry and the Pacemakers?